The act of writing his autobiography gave Eric Clapton the opportunity to re-examine every facet of his life. Perhaps the best thing that has sprung from the book, however, is that it sent him scurrying through his past in an effort to reconnect with each era of his career. Not only did Clapton record The Road to Escondido with J.J. Cale, but he also traipsed through his Derek and the Dominoes repertoire with guitarist Derek Trucks. In addition, he managed to set aside his differences with Jack Bruce and Ginger Baker to explore his work with Cream, and most recently, he and Steve Winwood reignited the creative spark that fueled Blind Faith. Clapton’s next project very well could include a tour with Jeff Beck. Beck famously had replaced Clapton in the Yardbirds in 1965, and until February, the duo had never shared the stage. However, after performing a pair of concerts together in Japan — where they tackled songs by Muddy Waters, Sly Stone, and Cream — both guitarists now are considering opportunities for further collaboration. A rare, home recording of Jimi Hendrix performing Bob Dylan’s Tears of Rage and 13 other songs will be sold to the highest bidder at an online auction to be held by Fame Bureau later this month. Hendrix made the tape in New York in 1968, while he was writing material for his groundbreaking, double LP Electric Ladyland. He subsequently gave it to Carl Niekirk, who frequently served as a doorman for Hendrix at his home in London. The recording is expected to fetch between $70,000 and $140,000. On January 28, keyboard player Billy Powell died of natural causes at his home in Orange Park, Florida. He was 56. Shortly before his passing, Powell had experienced shortness of breath and chest pains, the classic signs of heart failure. Powell originally had served as a roadie in Lynyrd Skynyrd’s crew, but by the time the ensemble assembled its debut in 1973, he had become the group’s keyboard player. In 1977, Powell survived the plane crash that took the lives of Ronnie Van Zant and Steve Gaines, and he participated in the reconfigured rendition of Lynyrd Skynyrd that began touring a decade later. For years, Steve Martin has used a banjo as part of his comedy routine. Once, he even appeared on The Muppet Show to perform Duelin’ Banjos amidst a crowd of puppets. Although Martin has always taken the instrument seriously, he has toned down the humor since 2002 when he joined Earl Scruggs and a slew of other banjoists to record a new rendition of Foggy Mountain Breakdown, which later won a Grammy Award for Best Country Instrumental Performance. 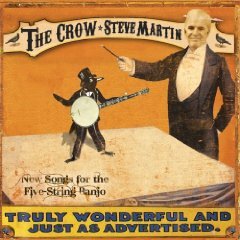 With the encouragement of his fellow pickers — Scruggs, Tony Trishcka, and Pete Wernick, among them — Martin began to cobble together his solo debut The Crow: New Songs for the Five-String Banjo. The album, which contains songs Martin wrote 40 years ago as well as more recent material, caught the attention of the Grand Ole Opry’s management. He promptly was invited to grace the prestigious institution’s stage for a concert on May 30.